Sarah Jo Byrd, 88, of Pensacola passed away Friday, June 15, 2018. Mrs. Byrd was born in Canoe, AL and resided in Pensacola most of her life where she sold Avon for many years. She also rated music for the Casey Casom Top 40 show. 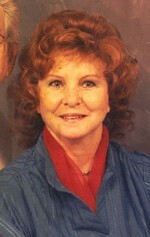 Mrs. Byrd was a dedicated wife, mother and grandmother. Preceding her in death is her husband of 71 years, Fred Byrd. Survivors include her son Billy Byrd (Karen); daughter; Linda Webb (Darrrell); six grandchildren, seven great children, and one great-great grandchild. Visitation will be at Trahan Family Funeral Home on Thursday, June 21, 2018 from 10:00 a.m. until funeral service begins at 11 a.m., with Brother Charles Mitchell presiding. The family wishes to express their heart felt “Thank You” to Covenant Care Sacred Heart for their compassion and care given to Sarah Byrd. To send flowers to the family of Sarah Jo Bryd, please visit our Heartfelt Sympathies Store.